All the basic growing information you've been missing! When I first started working at Freight Farms, I had never kept a plant alive, let alone grown something from seed to harvest. Which, when working at an agricultural company, probably isn’t ideal. As my failed attempts stacked up, I feared I might be one of those people that just wasn’t meant to grow plants. The more I failed, the more I became afraid of seeking out new information and trying again. But after spending the better part of a year with people who not only grow plants for a living, but do so because they genuinely love growing things, I realized that the problem wasn’t me… it was the fact that I had never actually been taught! I always thought the more water the better, right? Wrong. The more light the better, right? Wrong again. As I learned more from my peers, I realized that with some basic information—and a little bit of science—I (and all the other black thumbs out there) can pretty much grow anything! This was my usual confused look whenever trying to work with plants. This is me now that I've figured out how all this plant stuff works! And if I can do it, so can you. As I embarked on my research journey, I called upon the collective knowledge of my coworkers here at Freight Farms, and the entirety of Google to learn the basics. And, since Freight Farms is a hydroponic farming company, I decided to compare how the Freight Farms hydroponic farm makes growing plants easier than growing outside, thanks to the container’s environmental control technology. As with anything, I figured it would be best to start from the beginning. To understand how to grow something optimally, I wanted to learn about the growing cycle of a plant from seed to harvest. What were the main stages of development that I could track in order to measure a plants’ “success”? In nature, seeds are spread through a wide number of clever plant dispersal methods, but with human-assisted agriculture and gardening, it’s a pretty meticulously planned and executed process where we carefully space and count out seeds. A seed is a perfect package of all the nutrients and energy the plant needs to get started–just one example of genius engineering by Mother Nature! The seed can exist in the ground for a long time waiting for the optimal conditions to grow. However, when there’s enough water, sunlight, and warmth, the seeds become sprouts. Sprouts are the plants’ first leaves, and your first sign that you’re on track to successful germination. As the sprouts grow into fully fledged seedlings, you should see a taller stalk and more leaves. More importantly, this stage is defined by root growth as the plant seeks out more nutrients from the surrounding environment. You should now be able to tell any unhealthy plants apart from the healthy ones–the healthy seedlings will be taller, more sturdy, and with more leaves. Here you can cull the unhealthy seedlings to free up more nutrients for the healthy plants. As the plants become bigger and stronger, they enter the vegetative stage. This is as far as a lot of plants will go! All types of lettuces, brassicas, and herbs are harvested when they’re in this stage and make it onto our plates as great sources of fiber, nutrients, minerals. Other plants will continue to the budding and flowering stages, which constitute the beginning of the plant’s reproductive cycle. Flowers have male parts called stamen which produce pollen, and a female part called the pistil. In order for the plant to reproduce, the pollen has to get from the stamen to the pistil. This can be through self-pollination (pollen going to a pistil from the same plant) or, ideally, through cross-pollination, (pollen going to a pistil from a different plant of the same species, which makes the subsequent plant “offspring” stronger). This is where the very important work of pollinators such as bees, butterflies, hummingbirds, etc. comes in! If pollination is successful, then the plants will produce fruit with new seeds (i.e. the ripening stage). This is what we commonly associate with a “successfully grown” plant: We get to enjoy fruits like tomatoes (yes, they’re a fruit if you haven’t heard! ), apples, peaches, strawberries, and much more. Understanding what is happening in the plants’ life cycles is certainly helpful, but I really wanted to increase my knowledge of what environmental factors contribute to getting the plant from point A (seed) to point B (harvestable fruit or vegetable)! As you well know, water is essential for plants to grow. But, as with many things in this wacky world of ours, it’s all about balance. This is something new that I learned working at Freight Farms–apparently you can overwater a plant just as easily as you can under-water it (who knew? Not me!). This is all because of the plant’s roots, which are the delivery source for necessary, life-giving nutrients. The essential nutrients are all transported by water, so, naturally, too little water means a lack of nutrient delivery to the plant. However, too much water can also be damaging because it causes the roots to rot in the ground. Since unhealthy roots lead to an unhealthy plant, you can doom your crops in no time. I have some fuzzy recollections from 9th grade science class about what photosynthesis is, but (in truth), I’m pretty vague on the process of turning sunlight into plants. If you are too, here’s a pretty good refresher. Basically, for plants growing outside, you’re limited to the amount of hours of sunlight available. In the summer, as the days get longer, the plants are able to absorb more light energy for photosynthesis, and then use the captured energy to grow during the nighttime. Plants need nutrients in order to thrive and, in turn, the nutrients these plants absorb make them beneficial for us to eat. The six key nutrients are: nitrogen, phosphorus, potassium, magnesium, sulfur, and calcium. When growing plants in a traditional manner, plants absorb these nutrients from the soil. Based on the farming technique, gardeners and farmers will supplement their soil with synthetic or organic fertilizers. Temperature is another one of those factors that I knew was important, but really didn’t know that much about. Apparently, temperature affects photosynthetic reactions that are caused by enzymes (instead of light). The majority of plants can thrive between 55ºF and 75ºF: Anything colder or warmer will denature the enzymes, preventing them from performing their critical functions, which is a big factor in why few plants can grow during the winter! Additionally, humidity is very important for plants’ overall health because it affects how the plants “breathe”. If the humidity is too low, the plants experience drought stress, while, on the other hand, having too much humidity can rot the plants and create disease risks. Just another one of the reasons that plants are so great is that they ingest CO2 (i.e. waste) and expel oxygen (i.e. what we need to breathe!). CO2 is essential for non-light related photosynthesis activities. More importantly, CO2 and photosynthesis have a direct relationship, meaning that plants can’t get “too much” CO2. This isn’t typically a problem with plants growing outside, and is even contributing to a global “greening” as CO2 levels rise (one of the few semi-positive effects of global warming). For the most part, the ideal spacing depends on the plant species and fertility of the surrounding environment. You can either space plants from the get-go (check out this great guide), or plant indiscriminately and thin weaker plants out later. Either way, you will have to perform some kind of spacing tasks in order to prevent your plants from competing for the same resources and sabotaging each other. How does it all work in a container farm? The Greenery is designed to automate and simplify a lot of the key factors that influence a plant’s growth and development that can be difficult (or impossible) to control in an outside growing environment. The plants in the Greenery are watered on a regular, pre-set schedule that maintains the optimal level of root saturation without overdoing it. Also, thanks to gutters in the floor, a dehumidifier, and the A/C unit, our farm is very water efficient, using less than 5 gallons of water a day. This is 98% less water than traditional farming, which is pretty incredible for a system that is all water, no soil. We administer water in two ways. 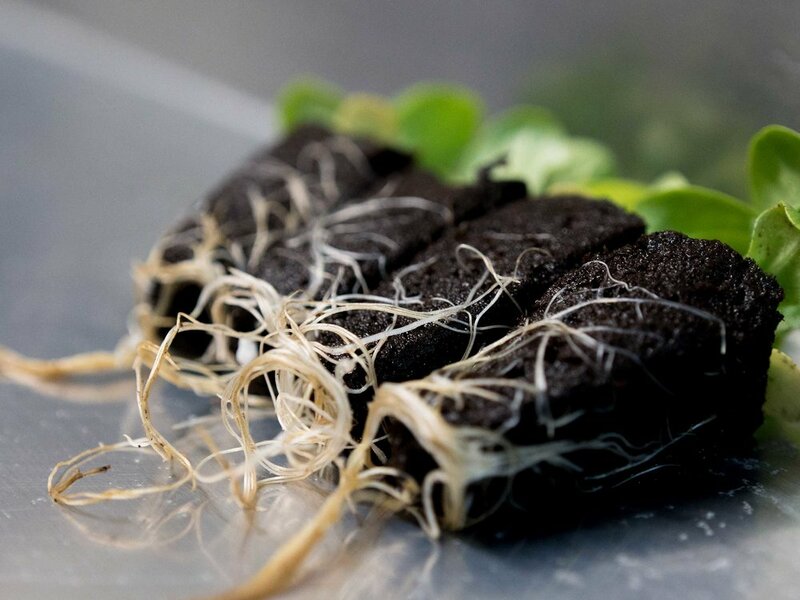 The seedlings have an ebb-and-flow hydroponic system, where their troughs are flooded so that the roots can “drink”. The mature plants in the towers have a drip irrigation system, where emitters drop water onto each column, which then soaks through a cotton “wick” and is absorbed by the plants’ roots. While the plants inside of the Greenery never see sunlight, they wouldn’t know it! That’s because we use high-efficiency LEDs to replicate sunlight inside of the container. The reason the lights are purple is because we’ve isolated out the red and blue light from the full light spectrum. The plants are able to absorb red and blue light much better than other types, making the LEDs extra effective. Although we have the capability to keep the lights on 24/7, we usually only have them on 18-20 hours a day. This provides the plants with more light energy that they would get outside (so they grow faster than usual), while also making sure they have essential the “night time” to rest and grow. This is a dense subject, so I actually wrote a separate blog post with all the details! Read Nutrients 101 to learn how our container farm replaces soil and still grows strong plants! Thankfully, the Greenery is season-agnostic, meaning that we have ideal growing temperatures year-round. We closely monitor temperature around a set-point, and can control it using the farm’s LED lights, which generate heat, and the A/C unit and intake/exhaust vents, which cool the farm. We are able to regulate humidity in the farm with the dehumidifier. While plants can’t get too much CO2, humans can. For this reason, we carefully monitor and regulate CO2 levels inside the farm to create an optimal growing environment that is not harmful to the farmer. We can control CO2 levels with the intake/exhaust vents. Spacing is equally important in the Greenery. 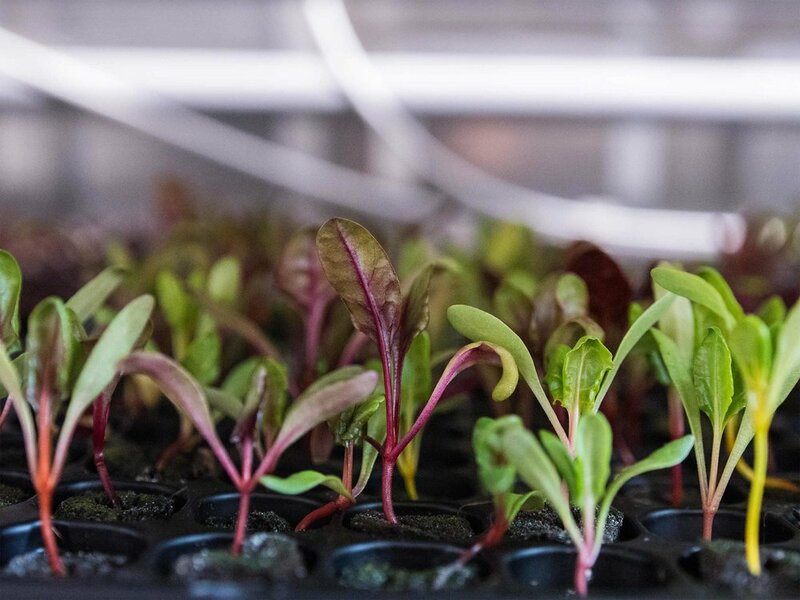 We start seedlings in smaller trays, and grow them in tight quarters until they get big enough to be transferred to plant panels, where they have more space. While each panel can hold up to 20 plants, we space each one differently based on the plant species and the size we want it. 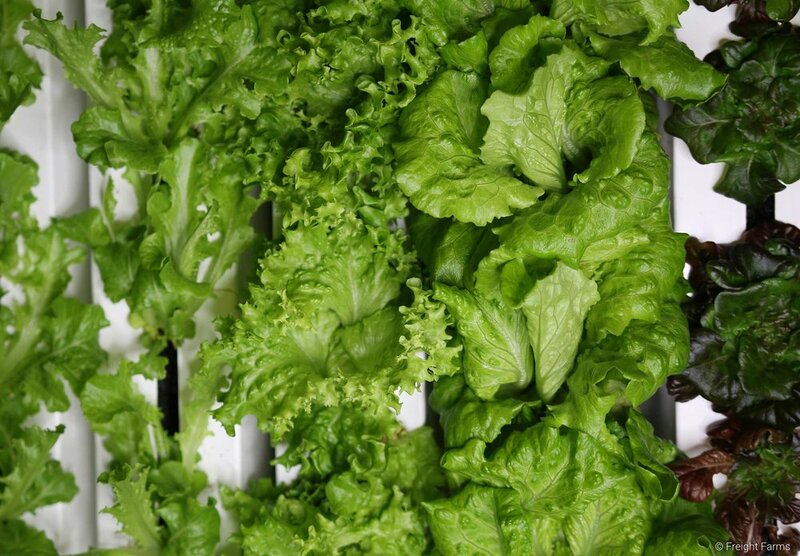 For example, mini-head and full-head lettuce are the same plant, the only difference is how closely they’re spaced (the more closely they’re spaced, the smaller the head), and how soon they’re harvested. Giving plants their own space is essential to make sure all of them are getting the right amount of nutrients, and that there is no constriction of airflow between the towers, which can lead to environmental issues inside of the farm. If you made it all the way through, you’re a real trooper, this was a ton of information! Hopefully you’re coming away with at least some new insights, or at least a refresher on the basics of growing. How Does Water Affect Plant Growth?